We don’t often think about the energy it takes to satisfy our thirst, but where we get our drinking water has huge consequences for how much energy is needed. In many parts of the world, fresh water sources like lakes or aquifers are becoming scarce, forcing residents to settle for supplies that aren’t as clean. And the dirtier the water, the more energy it takes to purify. Salt is especially hard to remove. In desert or coastal regions with limited sources of freshwater, residents must use a process called desalination to turn salty groundwater or seawater into drinking water. We’ve already covered how mixing saltwater with freshwater releases a lot of energy, so, to do the reverse– to remove salt from water– consumes a lot of energy. Exactly how much energy is required depends on the method of desalination. Distillation (which involves boiling) is a simple way to desalinate water, but it’s also one of the most energy-intensive. By using a technology called reverse osmosis, we can desalinate water using about 1/10th as much energy as distillation. So compared to boiling the water, using reverse osmosis is much more efficient. But reverse osmosis still requires about 100x more energy than treating fresh surface water or groundwater. 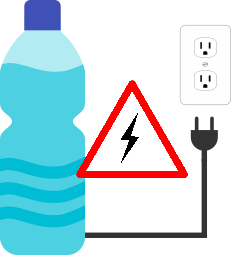 In fact, you could charge your smartphone with the energy it takes to desalinate just 1 gallon of seawater! Despite its energy demands, desalination is widely used around the world. There are more than 18,000 desalination plants in 150 countries, including about 250 in the U.S. About half of these plants use reverse osmosis, and about a third use distillation. In the U.S., most plants are located in Florida, Texas, and California (shown on this cool map), but there are about a dozen here in North Carolina. If you’ve ever visited the Outer Banks, your drinking water probably came from a reverse osmosis desalination plant. There are so many reverse osmosis plants in the world, that together they produce 4x as much water in one year as refineries do oil! But virtually all of these plants were built as a “last resort,” in areas where there simply isn’t enough freshwater to meet the needs of consumers, industry, and agriculture. When it’s available, treating freshwater is always preferable to desalination. The more we have to rely on seawater and other salty water resources, the more energy it will take to slake our thirst. So next time you take a drink of water, remember that you’re not just drinking ounces, you’re drinking watts. Want to learn more about reverse osmosis desalination? Check out this animated video from the Seven Seas Water Corporation. Ryan Kingsbury, P.E., is a PhD student at the University of North Carolina at Chapel Hill where he is a member of the Coronell Research Group. Orlando Coronell, PhD, and his research team study membrane-based processes for water purification and energy production and storage, with applications in municipal, industrial, and household systems. Ryan studies salinity gradient energy which you can read more about here. Tonight (January 11, 2017) at 9PM on PBS, a New NOVA Special titled The Nuclear Option will air. A related PBS Newshour segment, Innovating the next generation of nuclear power, is available for online viewing and may also be of interest. Program Summary (NOVA): Five years after the earthquake and tsunami that triggered the unprecedented trio of meltdowns at the Fukushima Daiichi nuclear power plant, scientists and engineers are struggling to control an ongoing crisis. What’s next for Fukushima? What’s next for Japan? And what’s next for a world that seems determined to jettison one of our most important carbon-free sources of energy? Despite the catastrophe—and the ongoing risks associated with nuclear—a new generation of nuclear power seems poised to emerge the ashes of Fukushima. NOVA investigates how the realities of climate change, the inherent limitations of renewable energy sources, and the optimism and enthusiasm of a new generation of nuclear engineers is looking for ways to reinvent nuclear technology, all while the most recent disaster is still being managed. What are the lessons learned from Fukushima? And with all of nuclear’s inherent dangers, how might it be possible to build a safe nuclear future? Earlier this month I conducted a teacher workshop devoted to the topic of electricity for science teachers from North Carolina’s coastal region. During the workshop I asked the teachers to tell me about the kinds of local energy issues they are confronting with their students and what questions arise in the classroom as a result. One teacher remarked that in light of the Desert Wind Power Project being constructed in the northeastern part of the state, he asks his students to consider the infrastructure needed to build a wind farm. His comment was timely, given that roads are currently being built to enable construction of the wind farm. When we evaluate the different energy sources that can be used to generate electricity we want our students to consider the accompanying infrastructure and land use change that results from the acquisition, management and use of those energy sources. 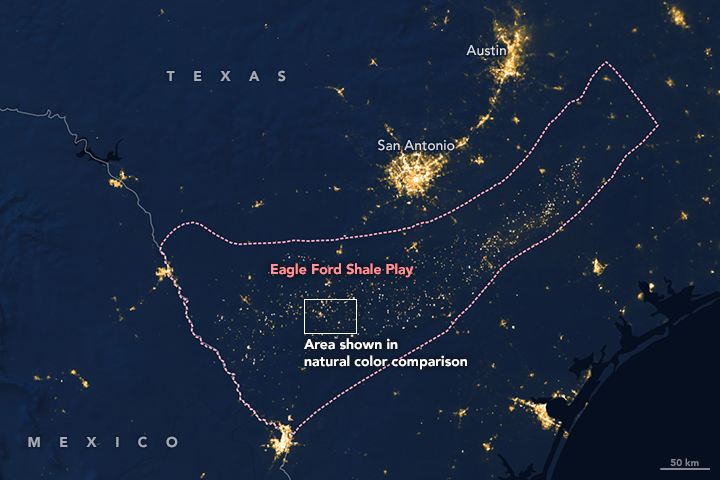 NASA’s recent Image of the Day titled Shale Revolution featured the infrastructure and land use change brought about by oil and gas acquisition in the Eagle Ford Shale Play in Texas. The speckles of light in the nighttime satellite image below are “the electric glow of drilling equipment, worker camps, and other gas and oil infrastructure combine with flickering gas flares.” Comparing daylight satellite imagery from the years 2000 and 2015 revealed a “bustling network of roads and rectangular drill pads had completely transformed the landscape.” Furthermore, this visual transformation invites the viewer to also consider the societal impacts of such development as well; Cotulla, Texas saw its population more than double in a very short time period! Thus, these images could be used to prompt a class discussion about the implications of oil and gas development, including the accompanying infrastructure and land use changes, on the local community. It will be interesting to compare satellite images of the land that will house the Desert Wind Power Project before and after the project is complete and to use these images to prompt student thinking about the environmental, economic and societal impacts of a land-based wind farm in rural North Carolina. Energy topics covered include coal, geothermal energy, hydraulic fracturing, mineral resources, nuclear energy, oil and gas and renewable energy. The “Basics” section for each energy topic includes a brief summary that also describes why this topic matters to society and that explains how geoscience informs decisions about the particular topic. The “Learn More” section includes links to introductory resources, frequently asked questions, related maps and visualizations along with references. Resources featured come from the US Department of Energy, Energy Information Administration, Geological Society of America, The National Academies and USGS and others. Furthermore, AGI offers three earth science focused activities aligned to the Common Core English Language Arts standards and the Next Generation Science Standards that can be used to prepare grades 6-12 students to read and evaluate informational text. Want to learn more? Check out AGI’s Center for Geoscience and Society. The International Energy Association’s publication Energy Technology Perspectives 2015, is accompanied by a set of interactive visualizations that utilizes the data and figures behind its publication on energy technologies. I am an advocate for having students visualize the entire energy system – the diversity of energy sources used to provide electricity to homes and industry and to power our various modes of transportation. I also find it useful to examine how the system is changing over time as our demand for energy grows in light of the need to limit society’s carbon dioxide emissions. These interactive infographics from the IEA illustrate how the world’s energy system will evolve through 2050. 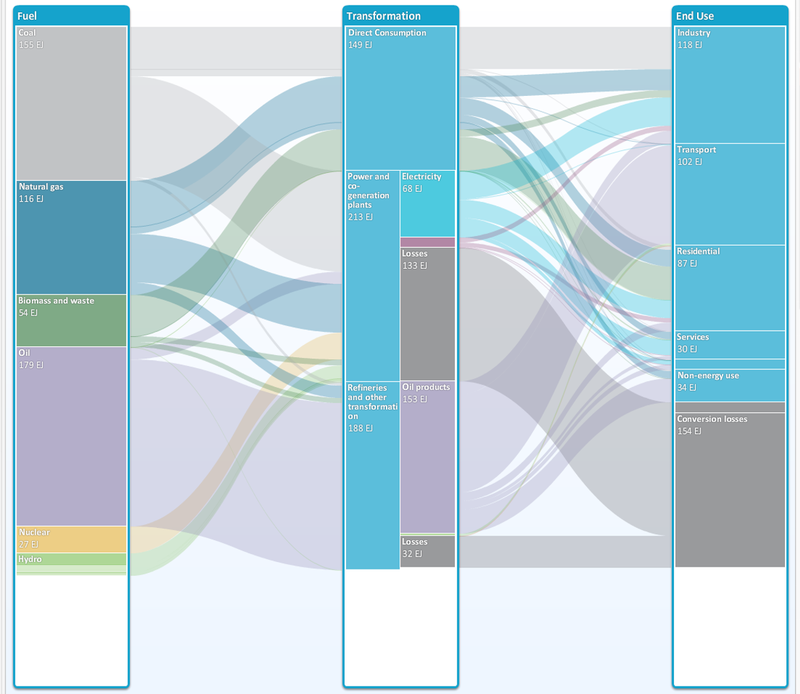 There are three parts to this online tool: an energy flow visualization, an emissions reduction visualization and a transportation visualization. Here I am featuring the energy flow visualization where the user can hover over a specific energy source, transformation or end user to study a particular energy flow. The diagram below shows the global energy flow for coal in 2012 and for 2050 (projected); one can easily compare the two graphics to see that coal use will decrease while global energy demand will increase. Have you considered asking your students to evaluate and explain energy flow diagrams? Global energy flow for coal in 2012 and for 2050 (projected). 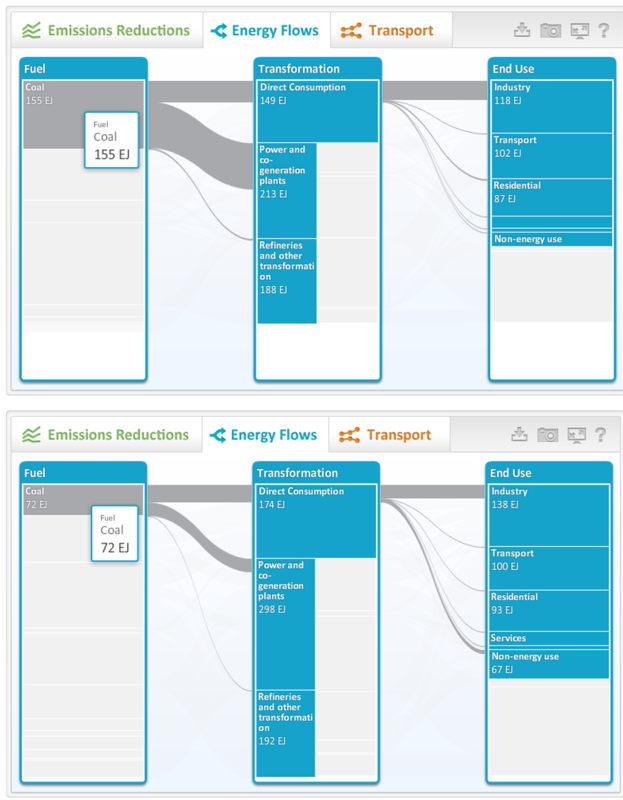 The emissions reduction visualization tool allows the user to assess how individual countries or regions can reduce carbon dioxide emissions via deployment of technologies and energy efficiency measures under three different warming scenarios (2°C, 4°C and 6°C). The transport visualization tool enables the user to select an “indicator” such as annual road energy consumption for a specific country, region or the world to visualize the extent to which the selected indicator needs to change to limit Earth’s average global temperature to either 2°C, 4°C or 6°C. According to the IEA website. “the 2°C Scenario is the main focus of ETP 2015. It lays out the pathway to deploy an energy system and emissions trajectory consistent with what recent climate science research indicates would give at least a 50% chance of limiting average global temperature increase to 2°C.” You can read the Executive Summary of the ETP 2015 here. And if you want to read more about energy flow diagrams, check out this post. 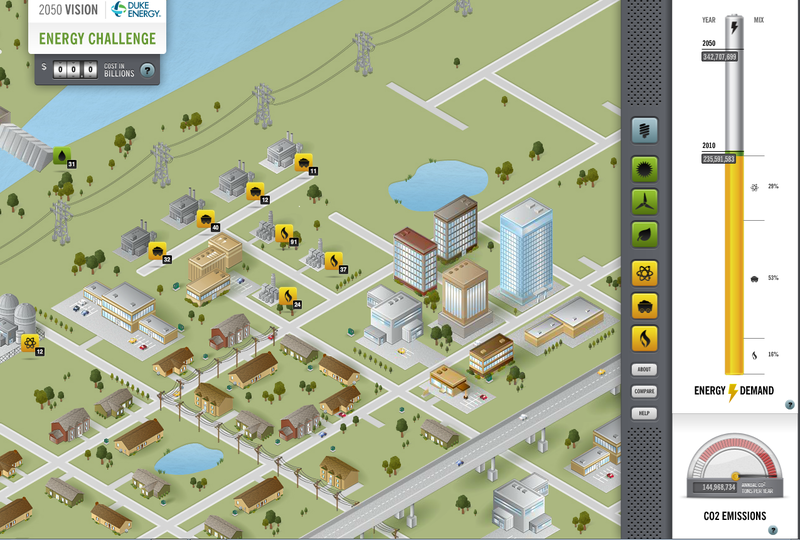 I recently learned about this interactive online “Energy Challenge” by Duke Energy where users create a plan to meet the energy demand of a carbon constrained world in the year 2050. Duke Energy aggregated data from across its entire U.S. service territory and created a visual representation of its service area and power generating facilities which sets the stage for the user who is tasked with making choices about how to meet a growing energy demand while working towards CO2 reduction goals. Choices that can be made by the user include: building new power plants, including solar and wind farms, upgrading existing power plants to produce more energy, retrofitting existing plants to reduce emissions, closing inefficient power plants and implementing energy efficiency programs. As users make decisions, such as retiring a set of aging coal plants or adding a wind farm, they get instant feedback regarding cost (in billions of dollars), impact on CO2 emissions (tons per year) and the extent to which their plan meets the predicted energy demand for the year 2050. The energy demand meter displayed on the right side of the screen makes it easy to visually monitor the extent to which a decision helps to meet energy demand and the extent to which this demand is met through non-renewable energy sources, renewable energy sources and energy efficiency measures. Duke Energy intends for this tool to “demonstrate the trade-offs and cost implications of choosing an energy generation mix that will meet future energy demand while minimizing CO2 emissions and keeping costs as low as possible.” I could easily see small groups of students competing to see which group can come up with a strategy that reduces CO2 emissions, meets projected energy demand for 2050 and costs the least amount of money. To learn more about the game, click here. One Indiana science teacher created a worksheet to accompany this game that could be used with your students. If you have your students play this game, please share your experience by leaving a comment!